Dogs are the cutest and most loyal pets men can ever have. Besides being loyal and cute, they are intelligent too. So adorable are they that, if you shower a little love on them, they will never leave your shadow and keep chasing you all over. The affable licks of your pet will greet your mornings. Dogs are called men’s best friends. You cannot underestimate the joy that you get while taking your dog for a long walk in the morning. However, keeping aside all the right things that you will get by owning a dog as a pet, there are certain liabilities on your part that you need to be aware of before owning a dog. There are certain aspects of the pet that you should know thoroughly before bringing the dog to your home. One such element is studying the behavioral patterns of your pet. The pets express excitement, fear, pain and even love that are triggered by specific stimuli. Being the owner of the pet, it is your responsibility to understand and recognize such behaviors of the animal. How to Keep Your Dog from Jumping on Door? If you own a puppy or a fully grown dog as a pet, you must have noticed the lack of judgment in your pet in determining whether the glass door is open or not. Such a situation often leads to physical injury of the dog, much to the worry of the owner. While some dogs tend to learn from their mistakes, this may not be true in all cases. That’s why you should know certain tricks to stop dogs from jumping on the door. In this post, we will outline a few points that will help you stop your dogs from jumping on doors. Let’s us have a quick glance at these points. If the door for entering the house and exiting out of the house is the same for both you and your dog, that seems to be a problem. If the dog learns that there is only one particular door for getting in and out of the house, they try to use it even when the door is closed. With entries having large glass panels, dogs cannot determine whether they are closed or open and tend to jump through it even when they are closed, which hurts them at times. To avoid this, make separate doors for your pet and train them to entry and exit only through the other door. Dogs see the doors with glass panel as an open portal, and so you need to take some steps to train the dog that there is an obstruction over there. It can be done by using nets or curtains. If the issue doesn’t resolve, try sticking some large colourful balloons around the door at the level of the dog. It will stop the dogs from jumping at the door. Even if they climb, the balloons will burst whose sound will prevent the dogs from doing it again. As mentioned earlier, the dogs follow the master. It is also true while you leave the house. As you prepare to leave the house, dogs take the cue from your actions and jump up against the door attempting to follow you. In this case, you should train the dog to stay calm and not to jump around until you walk out through the door. 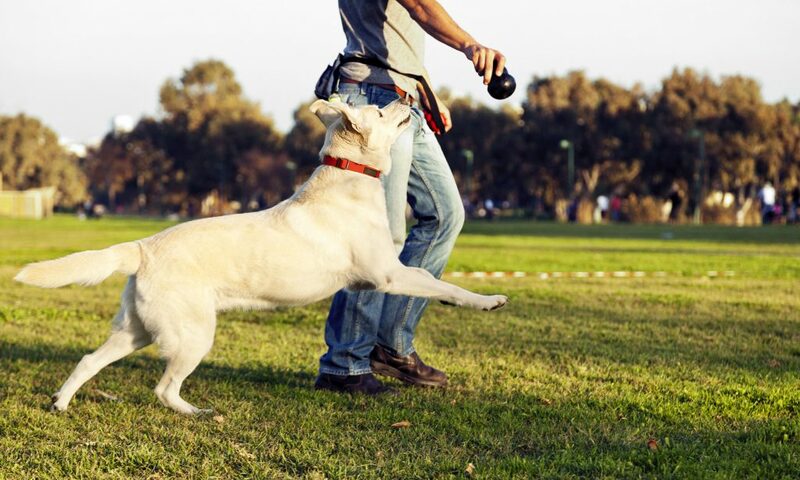 Keep a device such as empty tin with few coins which will create sounds to distract and divert the dog’s attention while they attempt to jump up. Shake the tin as soon as they try to climb and the noise thus created will distract the dog preventing them from jumping on the door. Dogs do love the company of their master. If you own a pet, it is your responsibility in giving him the most quality, activity-filled time that stimulates his mental and physical behavior. It is not wise to leave your pet alone at home for hours. Similarly, while at home, do not lock your pet in a separate room to prevent jumping on doors. It will give rise to other problems such as whining, scratching or barking. Studies say that dogs, just like the human, are pragmatic in nature who loves reward and attention. 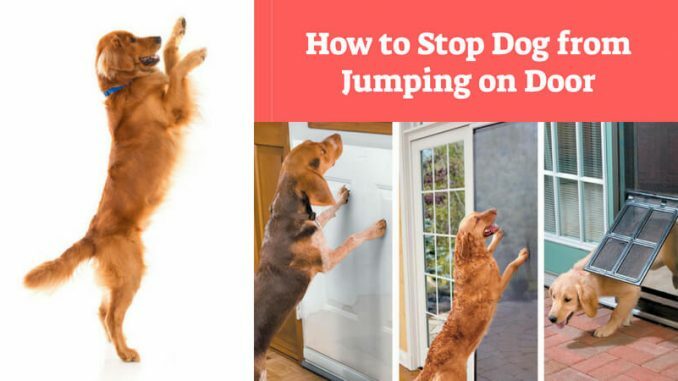 The jumping on door problem can be solved by giving proper care to the pet and training them appropriately. If everything fails, one last resort is to hold the front legs of the dogs while he tries to dance and act as if you are dancing. It will make the pet happy for a couple of seconds but will eventually want to be down. Keep holding the legs for a few more seconds. It will leave the dog perturbed and so will repeat the action later. So, with these steps, we believe you would be able to solve the jumping on the door of your pet and prevent him from getting any serious physical injury. Lastly, we must add that proper care and attention is a significant requirement that you need to provide as an owner of a pet.